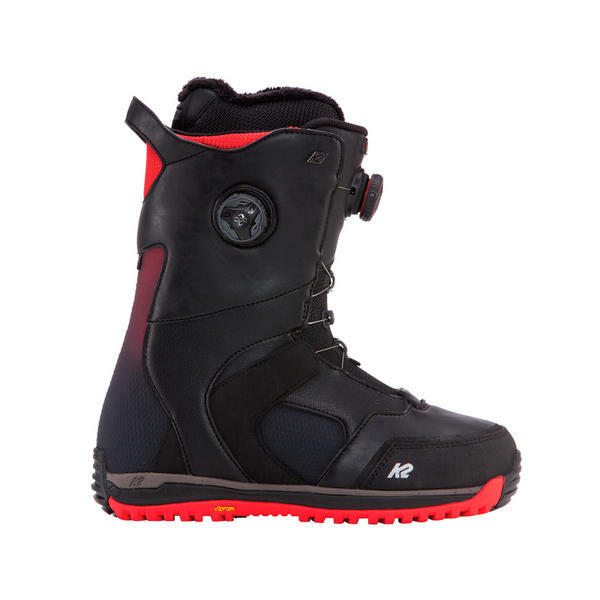 The stiff flexing and supportive K2 Thraxis is the go-to boot for anyone looking for a top end aggressive freeriding at the resort or deep in the backcountry boot. It is called the Thraxis as it uses 3 boa systems, yes I said 3! Three separate boa reel’s control three different zones on the boot to dial in precise fit, one controls the Conda system on the inside of the boot then the other two control the top and bottom zones independently. The Conda system replaces the traditional inner boot lace system with a urethane panel which the boa pulls back and down on to give you a precise locked in fit. 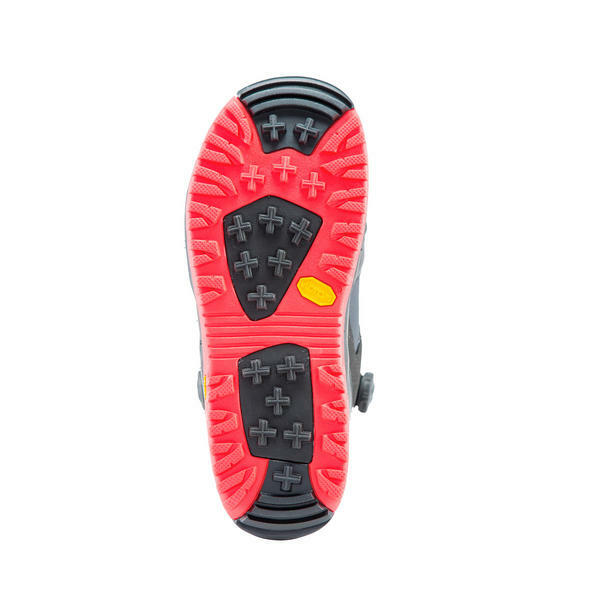 The advantage of this is it is controlled on the outside of the boot so you do not have to open your boot to fine tune the inner lacing system on the hill. K2 also adds a flex zone to the boot meaning the top and bottom of the boot can flex independently without compromising the integrity of the boot and breaking it down. New for this year K2 revised the Endo construction the Endo 2.0. 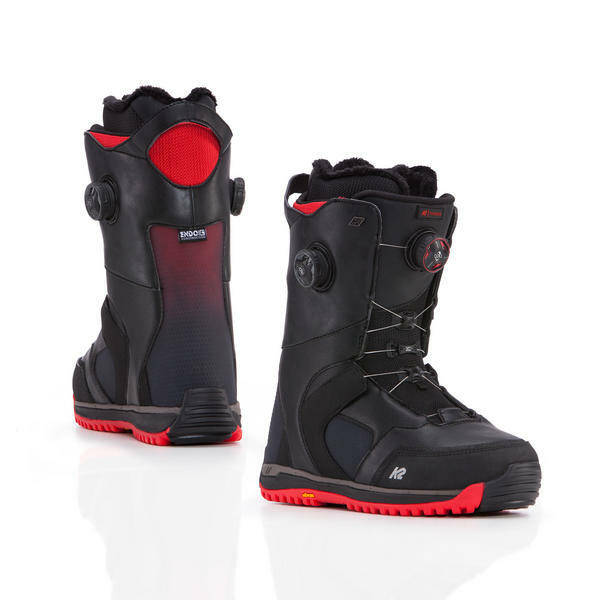 This construction helps to retain the original boot flex for daily riding durability with a full Urethane spine and side panels to the boot so if you do 100 days on the mountain this won’t change how the boot feels. It differs from last year’s endo by being textured to grip the binding better as it is more exposed now too, plus it is thicker where it needs it and thinner where it doesn’t. The liners on the Thraxis as always are Intuition Pro 3D fully heat mouldable liners, unlike other brands which only have this in sections. Intuition are regarded as the best liners around especially for custom fit with the Pro £d benefiting from internal and external J bars. The sole doesn’t get forgotten on the Thraxis with a full Vibram V4 outsole for a more lightweight sole with incredible durability and grip. When the terrain demands your full attention, the Thraxis helps you stay you laser focused and ready to drop. If you want a top end boot this is it, did I mention it’s the only triple BOA boot on the market too? Get them quick they sell out every year!